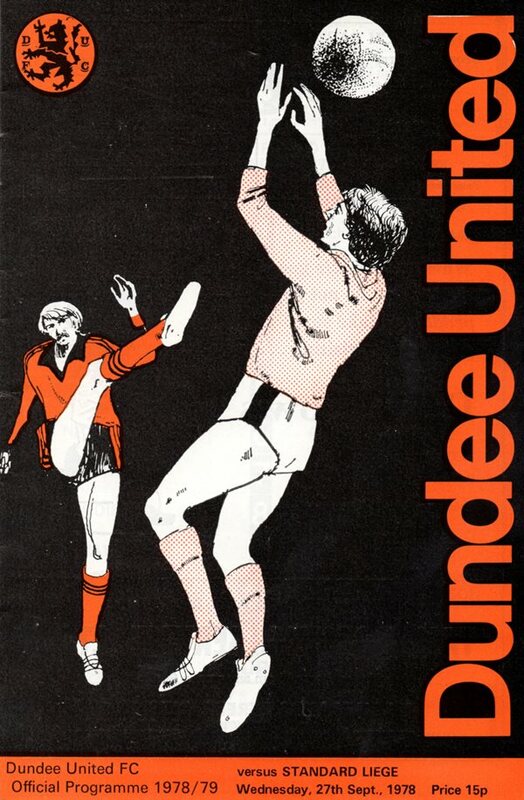 Wednesday 27th September 1978, was the date-line for the return leg which proved to be a night of bitter disappointment for Tannadice fans. It might have been different had referee Kirchen from East Germany not chalked off what looked a legitimate United score in the 25th minute. Frank Kopel lobbed the ball into the Standard net, but the referee chalked off the goal for an alleged infringement by Davie Dodds' challenge on the 'keeper. Five minutes before half-time, Gerets handled a Sturrock cross, but the United appeals were rejected. Almost immediately afterwards, Dave Narey struck the bar. However, Standard, packing midfield, frustrated United, and began to move forward as the game progressed. Icelander Sigurvinsson was only just prevented from scoring by Dave Narey in 57 minutes. United's task was becoming more difficult and more frustrating by the minute. In 70 minutes Hamish McAlpine brilliantly saved a Graf 40-yarder. United's last chance to take the tie into extra-time came 12 minutes from time, Dave Narey's initial effort was saved by Preud'Homme who couldn't hold the ball, but George Fleming shot the rebound past the post. So Standard survived United's onslaught to qualify by virtue of that single goal in Ghent.